They say Philippines celebrates the longest Christmas. I must agree since as early as September you will hear Christmas songs playing in the radios, Christmas countdowns showing in TV shows, malls, parks and major roads displaying colorful decors and dancing lights. And as the days go closer to Christmas Day, every Pinoy could feel that the spirit of the season intensifies all the more. Family reunions and parties are happening everywhere, many charitable works are organized and as records reveal, more people are getting married in this festive month. People are simply happier – more giving, more forgiving, more thoughtful, more loving in December. Filipinos are predominantly Catholics and we, Filipino Catholics, have 15 days of preparation before the Christmas Day, the birth of Christ. Midnight masses are held in Catholic churches. It is some sort of penitence and sacrifice to wake up 3-4AM that early in the morning and attend an hour mass for 15 consecutive days as a sign of commitment to renew Christian vows, repent from sins, and make oneself worthy to receive the Child Jesus on Christmas Day. As it seems any ordinary day here for most people, I cannot help but miss the busy household I have during this season. Especially those times I have to prepare great food on the table for my family’s dinner for the Christmas Eve or New Year’s Eve, my shopping escape to Christmas bazaars and last minute wrapping of Christmas presents for my friends and loved ones. My family wanted to continue the Filipino tradition of merry-making in this time of the year so weeks earlier we went on food exploration every after hearing Sunday Mass. The Catholic Church of the Holy Trinity in Tampines, Singapore. First Week. 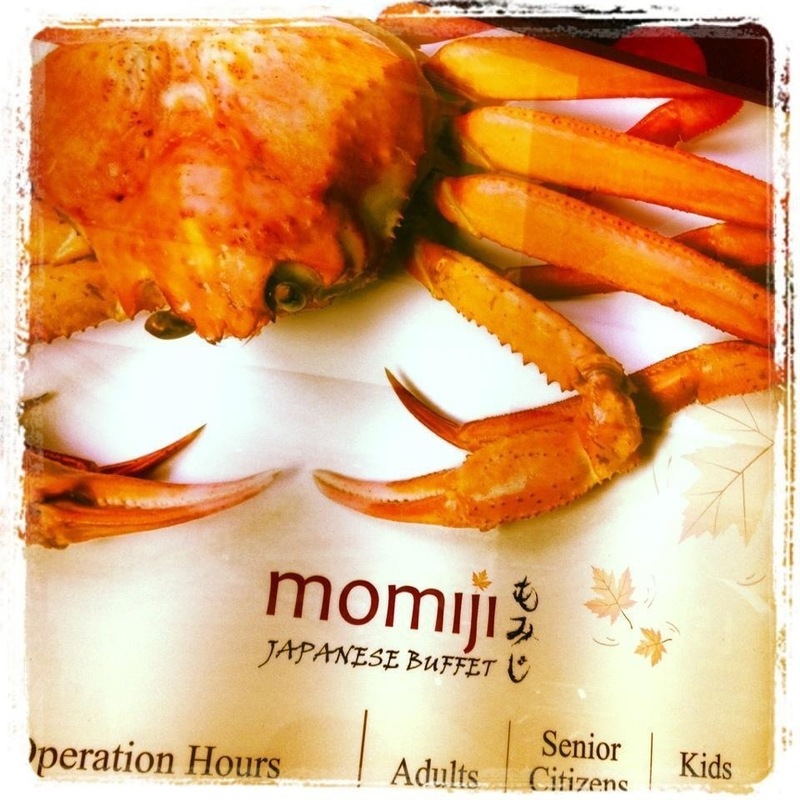 We went to Momiji, a Japanese buffet restaurant in Metro City Square Mall at the Kitchener Road (Exit Farrer Park, MRT Purple Line). There were wide selection of sushi, sashimi and rolls, seafood and meat skewers, shrimp and vegetable tempura, grilled chops; choices of miso, chowder and mushroom soup; fresh oysters and must-try king crab. For dessert, there were fresh fruits, different slices of cakes and pastries but my favorite was the cheesecake. Kids would enjoy the chocolate fountain and the different flavors of Dryers ice cream with Do-It-Yourself counter for toppings. Drinks were of great variety as well. They have green and red Japanese iced tea, fruit juices, soda, hot coffee and tea. Second Week. 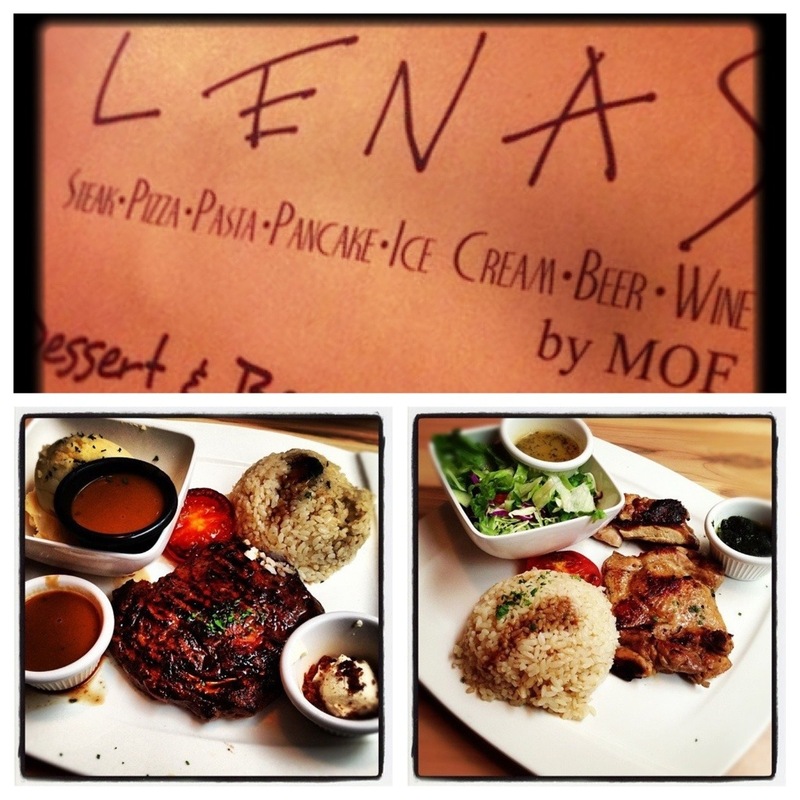 We headed to Lenas at Tampines 1 Mall (Exit Tampines, MRT Green Line). The restaurant offers good choices of pasta, pizza, ribs, steaks, fish and many more. Except for salads, food is either baked, grilled or fried, Western style. They also have refreshing juices and shakes, plus yummy gelato selections for dessert. I ordered pesto grilled chicken with rice pilaf and side salad, my husband had steak with corn cob and baked potatoes, and my daughter had cheesy beef lasagna and a scoop of chocolate gelato. The food was really good, service was okay. Third Week. We had relatives visiting Singapore for a few days and we wanted them to experience one of the best local hawker places we have tried here. So after some long, tiring sight-seeing walk from Marina Bay Mall to Raffles Quay, our relatives had a fun and filling, al-fresco dining experience at Lau Pa Sat (Exit Raffles Place, MRT Green Line). The food was cooked only when ordered, so it was served fresh, hot and oh so delicious! We ordered a package of chicken, pork, beef, mutton and prawn satay; grilled stingray, crispy baby squid, sautéed mixed veggies, Hokkein fried rice, and Singapore stir-fry noodles. 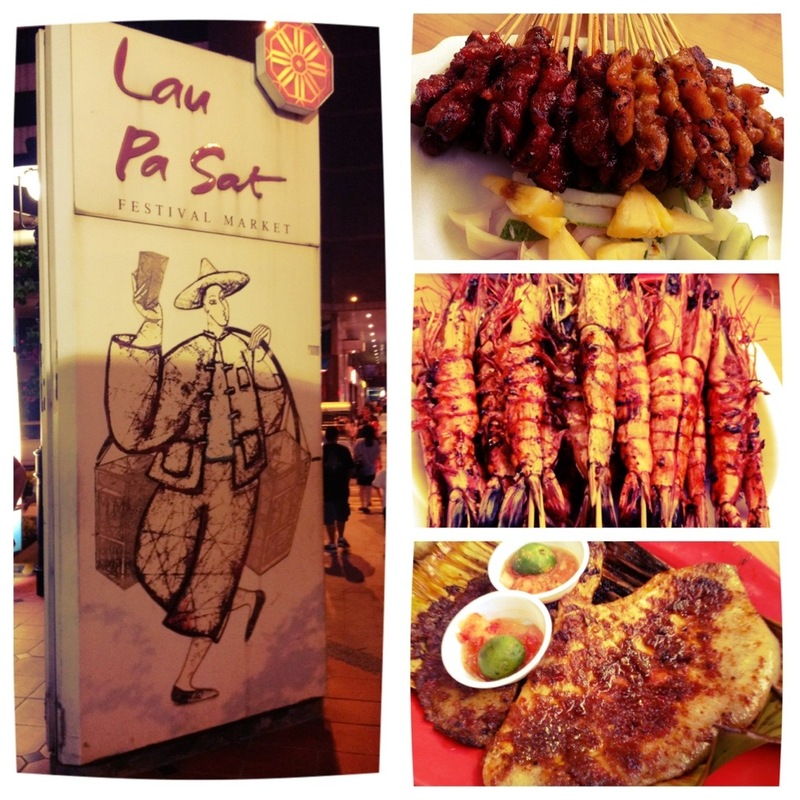 Lau Pa Sat (or “old market” in the Hokkien dialect) was Singapore’s first wet market that dates back over 150 years ago to the time of Sir Stamford Raffles, the founder of Singapore. It was subsequently converted into a famous gourmet paradise and has been gazetted as a national monument since 1973. Fourth Week. Christmas Day. We spent Christmas Day at the Universal Studios. Unexpectedly, the theme park that time was not very crowded, the queues to popular rides were just 10-15 minutes waiting time, and the weather was not too warm. We had fun singing and dancing during the snow show (they used soap foams) at New York Street. We love dining at AutoBot Café, located next to the Transformers Ride at the Sci-Fi City but the Turkey Leg in the corner food kiosk was so inviting that we gave in. We tried it and it was awesome! To cap that special day, we checked-in at Amara Sanctuary Resort & Spa. 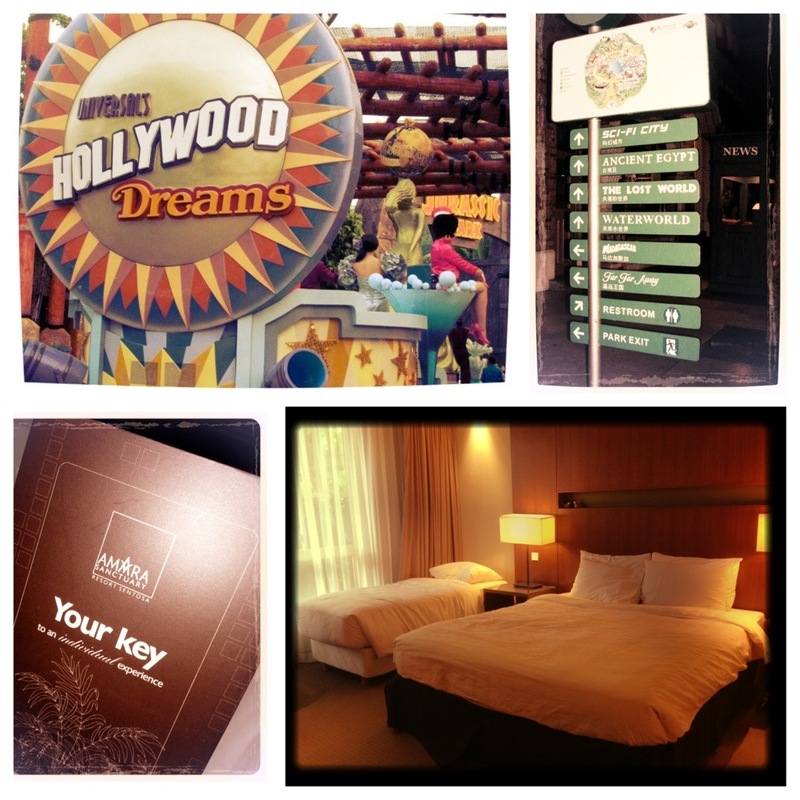 The hotel is located within Sentosa Island and few minutes walk from Universal Studios, the Merlion and Imbiah Station. Fifth Week. New Year’s Eve.We had no big plans for the New Year’s Eve and we simply wanted to relive our first and memorable experience of New Year Countdown at the Marina Bay in 2008. 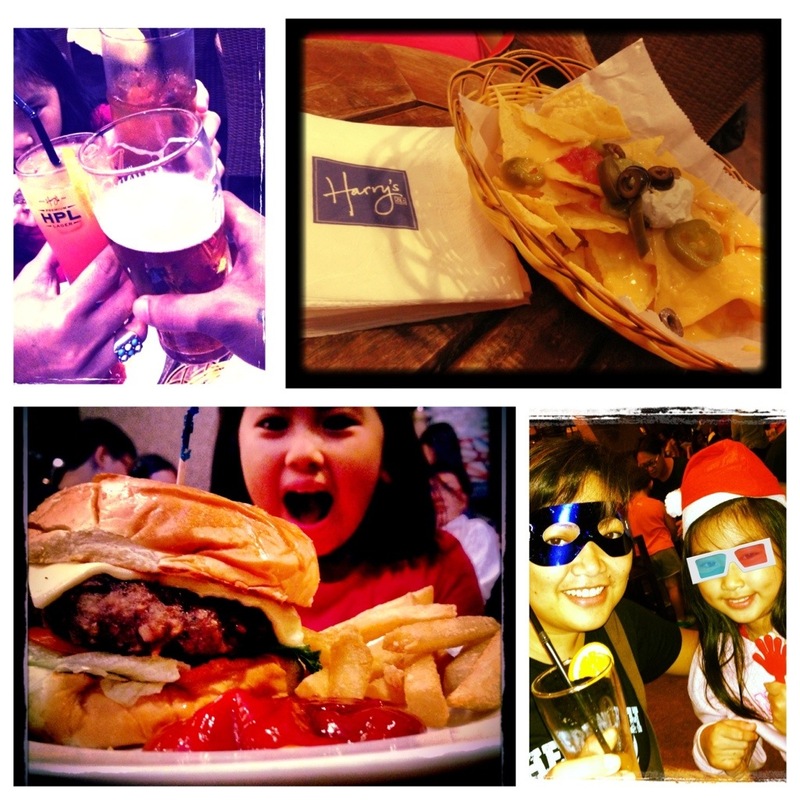 We dined at Harry’s Bar at the Esplanade (Exit City Hall, MRT Green Line) around 10pm. It was drizzling and a bit crowded along Marina Bay but our location was perfect. The bar is connected in the mall so it was covered and the stage where they were doing the countdown was just few meters away from us so we did enjoyed the good music that the live band was playing. My husband ordered some premium lager while I had tequila sunrise and had my first taste of the Singapore sling. Their nachos and sausage platter were great. My daughter enjoyed her iced lemon tea and sumptuous cheeseburger with crispy Belgian fries. I may say that the crowd at Harry’s was also in party, merry-making mood so it was really nice to be surrounded by such people. When the clock finally ticked 12 midnight, colorful fireworks, invigorating music and just some magical feel swept us away. It was a beautiful, beautiful 1st day of 2013!